Sandown Park is a nice track to drive with a good variety of challenging corners. The setting is very picturesque too as it is tucked right in the middle of Sandown Park Racecourse, so as a result the track is sometimes closed to let the horses have their go! A wide range of race formats to suit all tastes. More events for large groups available on request. Isles roundabout, bear left onto the Portsmouth Road. set of traffic lights travel across these and the second set. Stay in the middle lane and go straight across. The aim of this course is to acclimatise your youngster (5 to 7 years ONLY) with the basic controls of the kart. They will spend time getting to grips with the brake, accelerator and steering during the first part of the on-track period. The rest of the session will be dedicated to racing with other youngsters and learning how to be competitive. Non-exclusive sprint race (10-mins qualifying plus a 20-min race) using the 125cc water-cooled 2-stroke karts. Exclusive use of the circuit for up to 10 cadets driving single-engine go-Karts - 1 x 25-minute session. 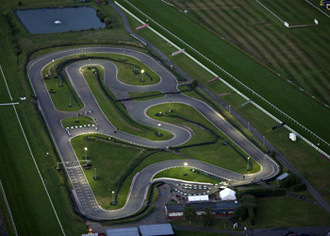 Exclusive use of the circuit for up to 20 cadets driving single-engine go-Karts - 2 x 25-minute sessions. There is an outdoor track, which is floodlit. The site is well signposted from the nearest road. The venue runs specific junior birthday packages. The venue has an up-to-date Risk Assessment. The venue provides cooked meals. There are conference facilities for 100+. Projector screens and other AV equipment can be provided. There are separate male and female changing rooms on site. They run tuition or training sessions. Minimotos (mini-motorbikes) are NOT allowed on the circuit. c. Any extra cost borne by us as a result of any government legislation or EU regulation.